When we decided to move to Korea, Anyang seemed like a good fit, in part because of its easy access to Seoul. And sure enough, most weekends we find ourselves taking the 40 minute subway into the city of almost 10 million people to explore some of Korea’s best experiences. It has food, culture, energy, history, and everything to make it a truly international city. This weekend we decided to knock a few things off our list that we had been talking about for months. We had 3 major goals for Saturday: Palace, Dogs, and Fish. 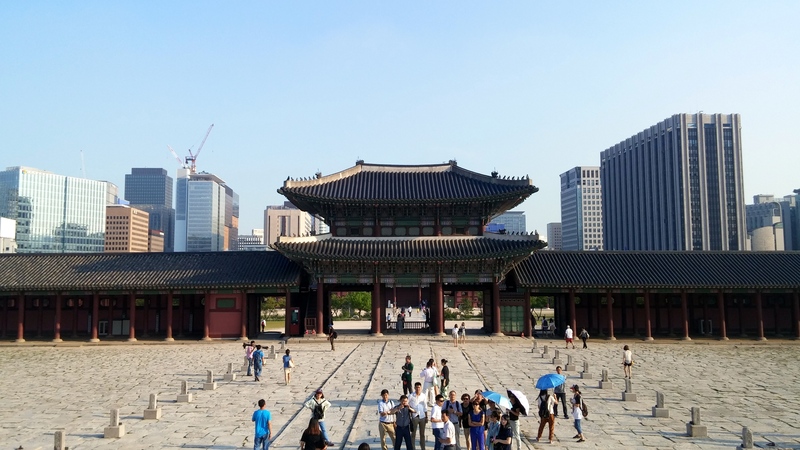 Gyeongbokgung Palace is one of the capital’s royal palaces. It was first constructed in 1395, but subject to rebuilding multiple times because of fires, medieval Japanese invasions and the Japanese Occupation in the early 20th century. (Note: there is some serious historic tension between Japan and Korea, and our tour was filled with events faulted to the Japanese). Gyeongbokgung was used as recently as 1910, after that point the Japanese modified and demolished much of the area. The palace itself it made mostly of wood and contains huge open courtyards and meticulously landscaped ponds. The tour was filled with interesting comments on the lifestyle, and architectural symbolism. One of my favourite points was about the king: He had 2 scribes; one wrote down anything he did, while the other wrote down everything he said – and at no point could the king see, or change what these men were writing. Below are some photos from our tour at the Palace, which we were able to freely walk about. Dog Cafes. They are everywhere in Korea! This particular one was pointed out to us by a large dog mascot advertising on the streets of Myeongdong. Alyx and I both have dogs and have been without any canine interaction since we left for Korea. A dog cafe was the perfect way to play with our favourite kind of pets again! For about $8 CAD you get a free drink and can stay at the cafe for as long as you like. It was a huge open room with tables around the outside and dogs. Dogs everywhere. Big dogs, small dogs, hairy dogs and bald dogs. Black dogs, white dogs, pure bred dogs and red dogs. They must have had close to 20 different dogs walking around this place. People were sitting on the ground and dogs would casually wander up and plop itself in your lap. Alyx and I each had a dog that liked us. They would sit for a bit, then wander and eventually come back – knowing our laps were obviously the best. It also had a few very large dogs, like dalmatians, labs, and a great pyrenees. Dogs cafes are a great idea for those craving some canine attention while in Korea. While you couldn’t play with these dogs in the same way you would with your own, they were very friendly and just loved having a place to sleep in your lap. On the down side, there were some very unfortunately shaved dogs. One even had a red tail and a red heart shape on its back. For the most part though it was awesome. For 8,000 Won you can’t complain, especially if you get any drink free. Apparently we couldn’t get enough animal interaction with just one stop this weekend. Alyx and I tried out something called doctor fish. Illegal in most of Canada but common in Korea, doctor fish are small little fish that scavenge your feet picking off the dead skin. We’d been looking for one of these places for a few weeks without any success, but luckily stumbled onto one while in Myeongdong. (Look here for a map to the Dr. Fish spa, it’s on the 5th floor of the building with a Lotteria. It had a sign out front as well). It’s a strange concept to get used to, and such a weird feeling when they are on your feet. Hundreds of these fish were instantly attracted to our feet as soon as they were in the water. These fish made it everywhere. Between our toes, and up our legs to the edge of the water. It felt like pins and needles, but you couldn’t stop it. Alyx was super ticklish and had to master her self-control to keep from scaring the fish off. After about 10 minutes though we were finished and upon taking our feet our of the water, noticed just how smooth they were! It was super cool. I’d do it again, cafes with these fish even exist, so you can enjoy a coffee while fish enjoy your feet. What an experience! Overall it a was a great Saturday spent in Seoul. And there are many more to come!